The now defunct Tanjong Pagar railway station holds a special place in my heart. Most of my Sundays during primary school were spent marvelling at the majestic machines, and exploring the white marble building. And then, there was the food. Splayed across the compound were multiple Indian-Muslim stalls serving a sumptuous feast of chapati, prata and briyani. Most of these stalls have ceased to exist but one survivor remains in the form of Ali Nachia Briyani Dam. 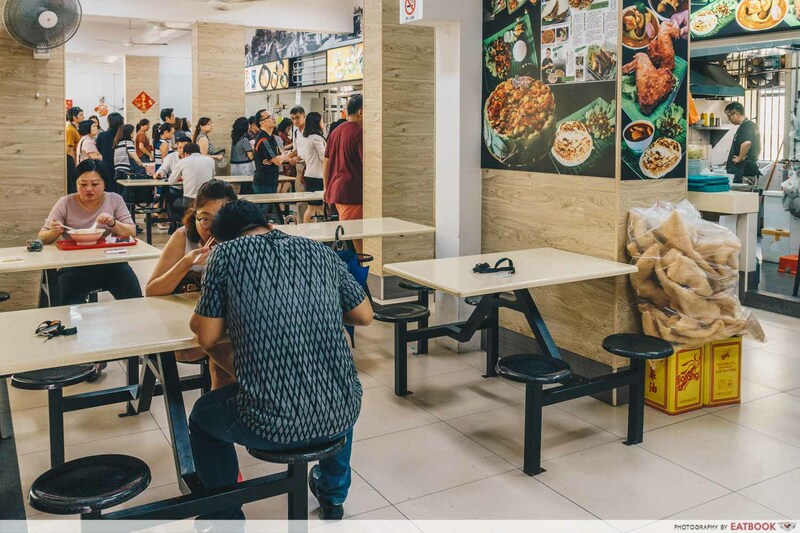 Now located at Tanjong Pagar Plaza, the stall only sells three items – all of which are variations of dum briyani. 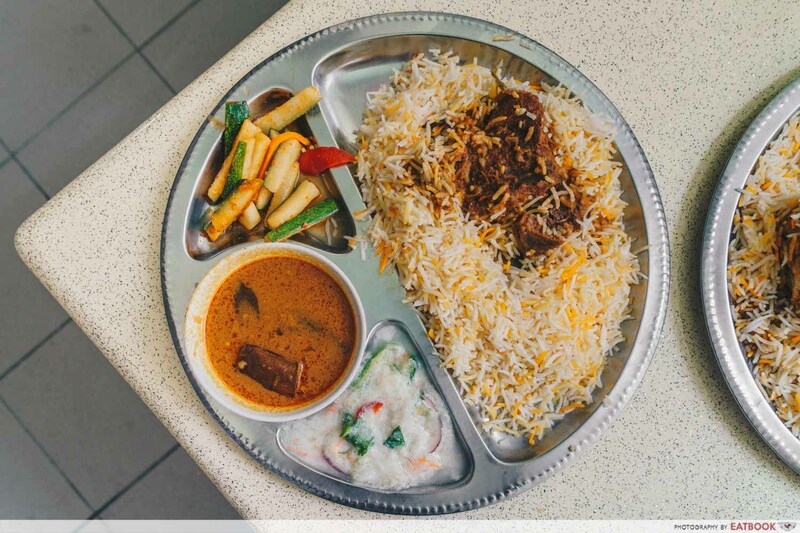 First up to bat was the Mutton Briyani ($8). Like all the dishes here, the rice is served on a thali (metal plate) and accompanied with raita (yoghurt), achar, and curry. 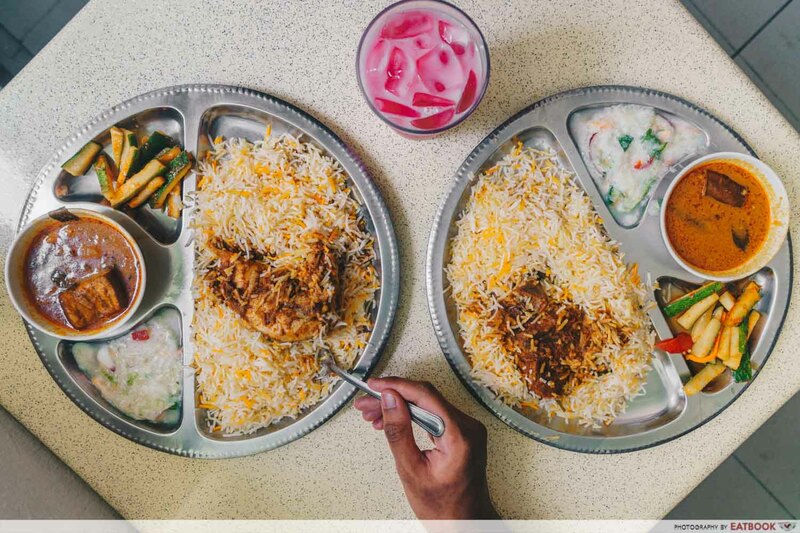 Although there are many differences between dum briyani and normal ones, the main essence can be boiled down to how they’re made. 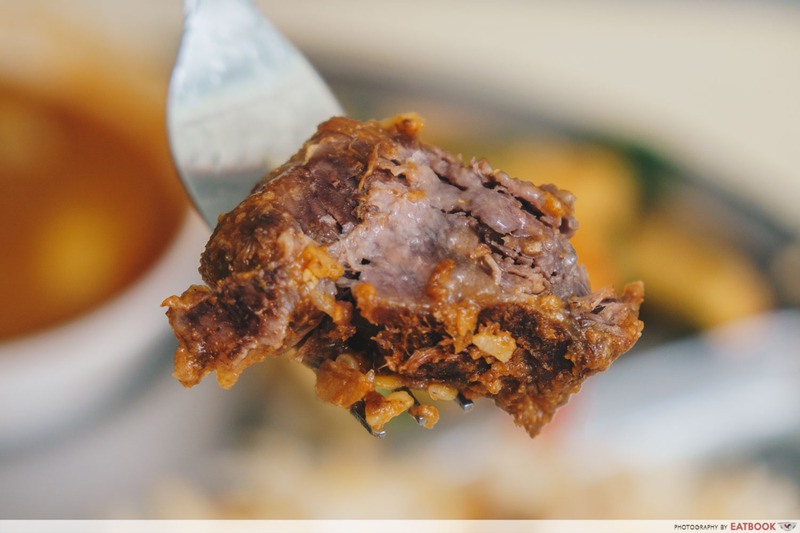 The dum method requires meat to be cooked with basmati rice in a sealed pot, which in turn makes the grains less oily and more flavourful. Suffice to say, the rice here wasn’t clumpy and were fragrant to boot. Personally, I felt like they could have been more moist – though a dab of curry did the trick. A testament of the dum method lies in the mutton. The meat we had was extremely tender and offered zero resistance as we tore into it. In terms of size, it was sufficient for the amount of rice we had though I felt that it could have been bigger. Taste-wise, it was mild and you could faintly taste the masala spices emanating from the mutton. 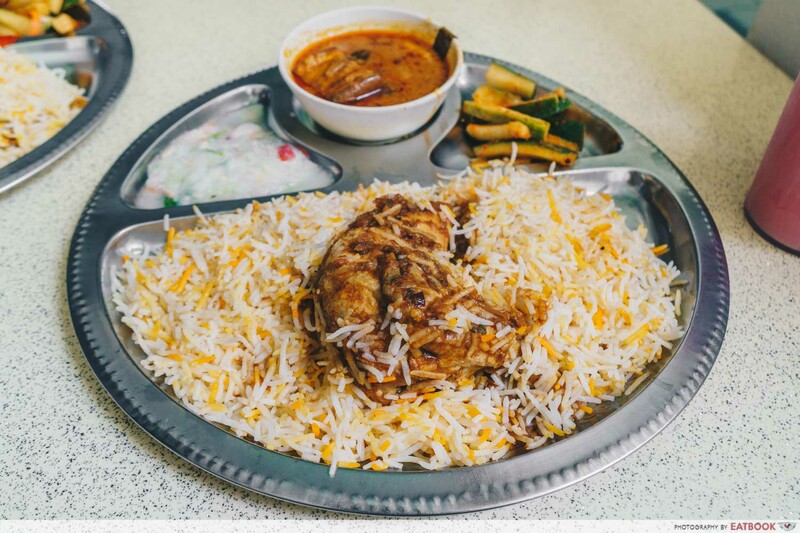 Next up was the Chicken Briyani ($7) which featured a huge slab of chicken thigh in place of mutton. Comparing the two plates side by side, it’s easy to see that the chicken is larger than the mutton. So if you’re looking to pump up on ’em protein gainz, you know which plate to get. Just like their mutton, the chicken here was easy to tear apart and boasted a pronounced spiciness. That being said, I felt that it was slightly dry. Between the two, the mutton briyani was my fav’. 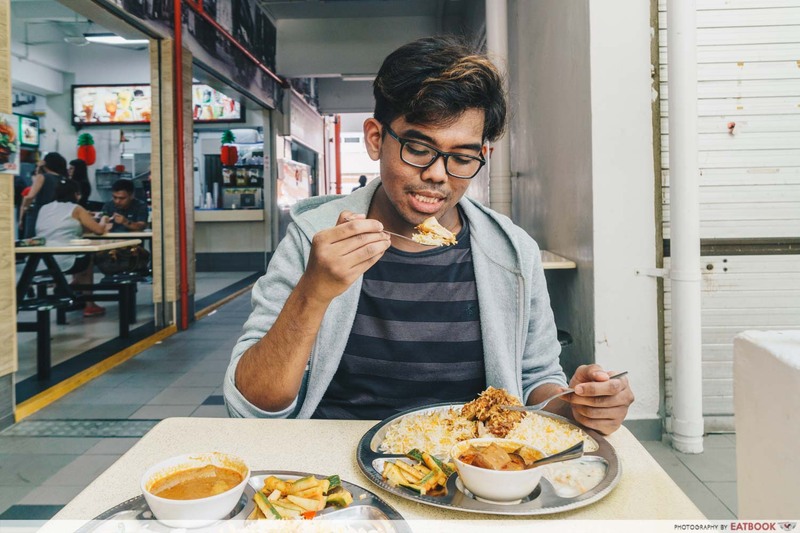 The last item on the menu is the Fish Briyani ($7). 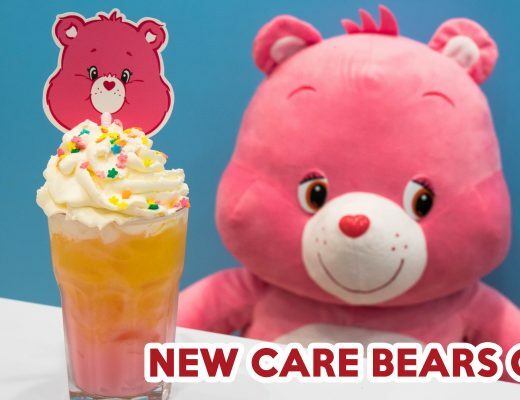 Unfortunately, we didn’t get a chance to try it, as it’s only available on Fridays. Their curry was simply amazing. 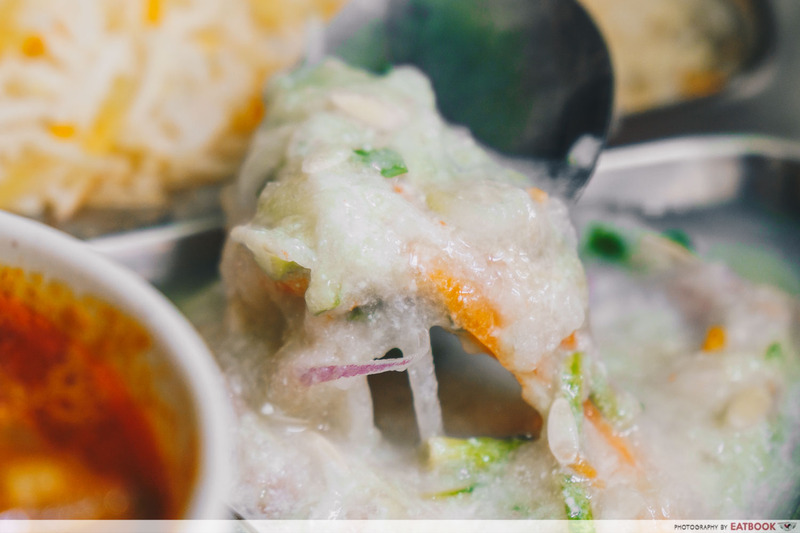 Swimming in the orange broth are the usual suspects of potato and brinjal. 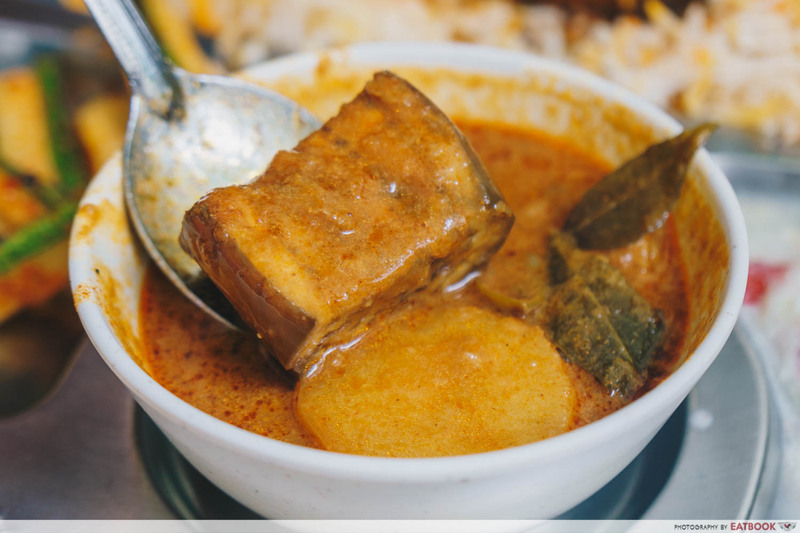 However, what sets it apart from other curries is the strong assam kick which added depth to the, otherwise, monotone dish. On its own, I didn’t enjoy the raita as it was too watery and tart. 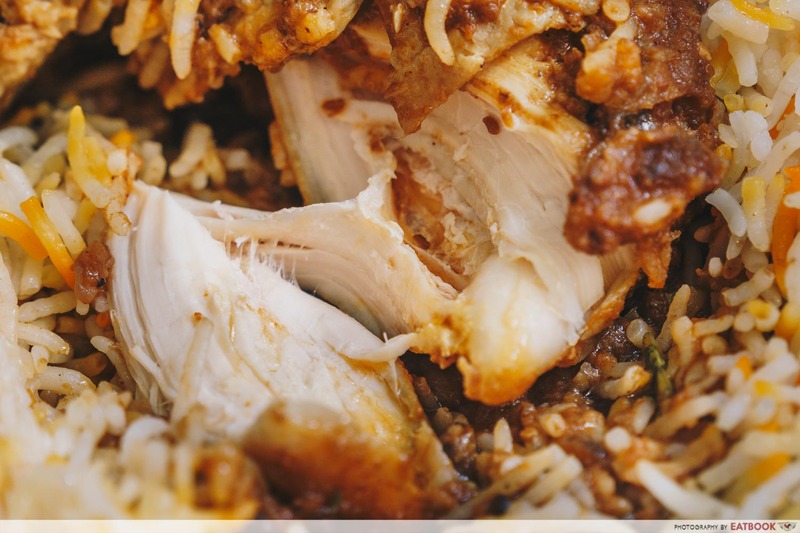 However, the beauty of the briyani here was that its strength lies in the sum of its parts. 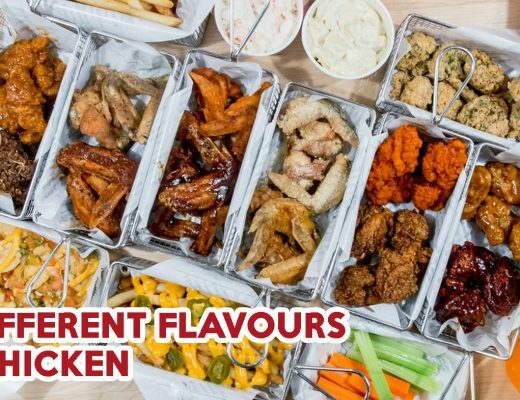 When eaten together, each component gave complementary flavour profiles which elevated the taste of the dish. For instance, the yoghurt amplified the savouriness of the mutton while the curry made the rice more piquant. 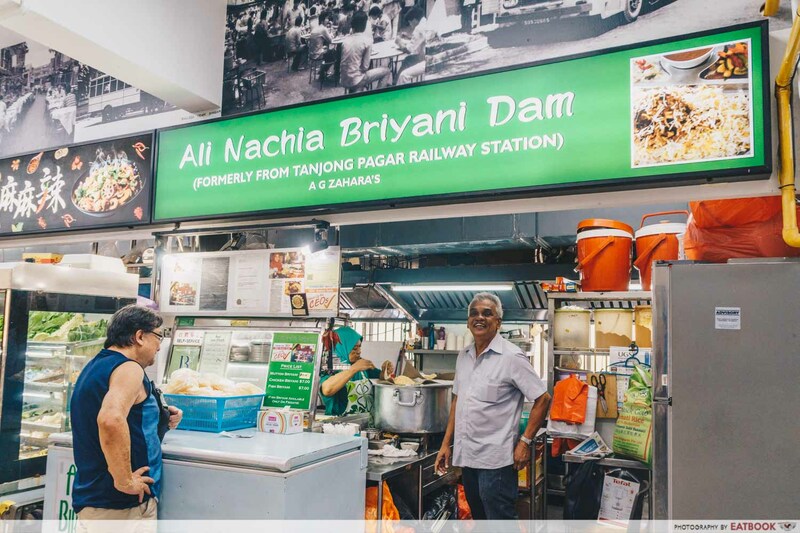 Fronted by the ever-beaming Mr Ali, Ali Nachia Briyani Dam occupies the corner lot of the rustic Tanjong Pagar Plaza food court. He’s been in the game since the 70’s and shows no sign of slowing down. His delish briyani is a clear sign of that. The food court itself was well-ventilated and well-lit. 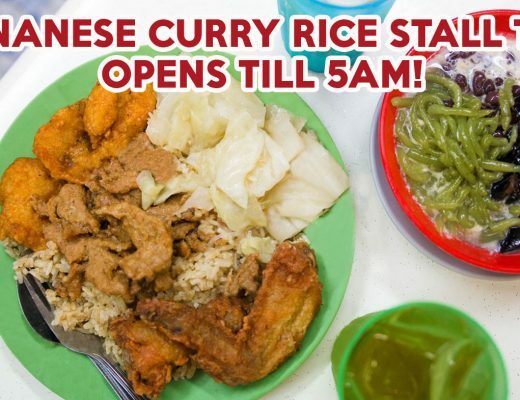 However, if you’re gunning to eat here, be sure to head early as spaces are limited and a lot of these stalls are popular. Was this the best briyani I’ve ever had? Nope. But it served its purpose and left me feeling satiated for the entire day. I guess its appeal lies in nostalgia and knowing that a piece of the Tanjong Pagar railway station exists somewhere. Just ask my dad. He was beyond happy after finding out the new location of his long-lost briyani haunt. 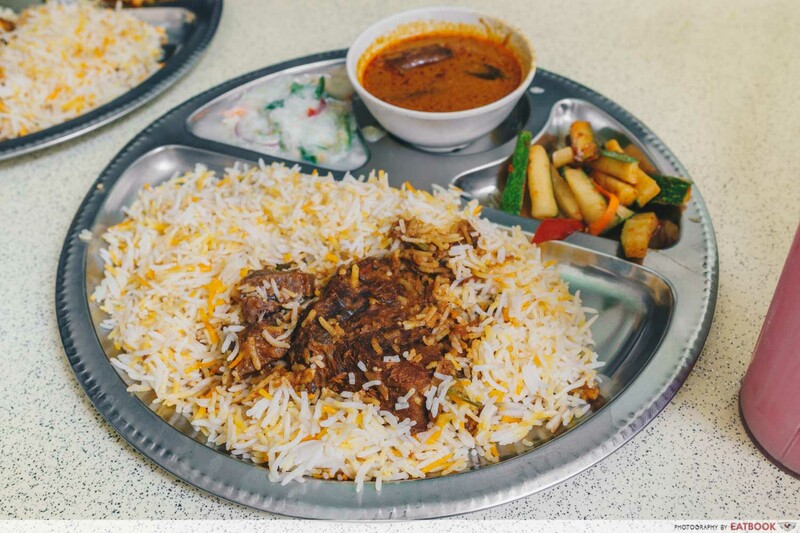 Ali Nachia Briyani Dam is a halal eatery.